I lost track of time and realised my only opportunity to make this week’s Tuesdays with Dorie: Baking with Julia recipe was going to be Monday morning, before school. Definitely not an ideal time! I read the recipe and realised all I had to do was put some flour, milk, eggs, a little bit of melted butter and a touch of salt in a blender and process! Once I wrapped my head around what I needed to do to make this happen, I was ready! I could actually pull this off! I made these in my mini muffin pan and they were soooo cute! 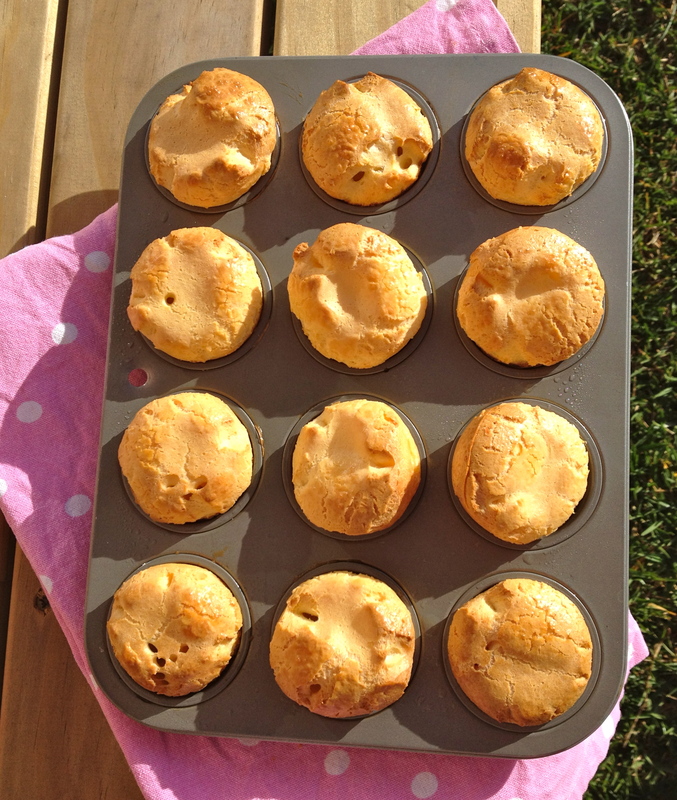 Popovers are not Aussie thing (or at least I don’t think so!). I’m glad I made them, they’re ridiculously cute! But I don’t really “get” them. They tasted a bit eggy and custardy inside. I liked the crispy exterior. I tried them with butter, honey and even jam. They were ok… But I just didn’t ‘get’ them… I’m not even sure what I mean by that!!! The kids tried them, one wrinkled her nose and the other said he’d rather eat his Weet-Bix. I’m glad I made them but I don’t think I’ll be making them again. I’m keen to check out what the rest of the TWD group thought! If you’d like to try them for yourself Paula of Vintage Kitchen Notes and Amy of Bake with Amy are this week’s hosts and have the recipe posted on their sites. Ah – popovers are fun, but not overly substantial. I have played around with them and had a chocolate version and then a buttermilk version with chives & corn. I had never made them and didn’t know what to expect. I was pleasantly surprised. I think they are a mini German or Monster Pancake. We ate ours with butter and jam. Hubby said he would eat them with a Sunday dinner of roast, potatoes and gravy kind of like Yorkshire Pudding. I guess you can eat them any way you like. Your right they are just darn cute. I like your mini version–perfect for the grand kids! me too me too… i didnt get them too!! and my muffin tin wasnt too deep… so they didnt really get the desired shape… but yours came out fabulous!!! i love the shape and colour!! Very cute! I think this is probably the quickest and easiest recipe in the book, perfect for a last-minute, pre-breakfast baking session. These are a lot like Yorkshire pudding, muffin-ized. They are cute and very simple! Too lovely! They are really cute! I’ve made some sweet and some cheesy (Grana cheese) adding some rosemary and spices… This recipe is a winner! PS: searching around the web I’ve found that 99% of the popovers recipes takes ONLY 2 EGGS (same amount of flour and milk). I wonder if maybe letting one egg out will reduce the “eggy taste”. Thanks for that, I was thinking of giving them another go, I’ll try it with two eggs and it may make it easier to compliment with toppings then. I LOVE the idea of a mini version! I think they are an acquired taste…they remind me of cream puffs, but they lack all the acoutrements! love the cuteness! To me, they tasted a little like yorkshire puds. I understand you not getting them, they´re fun but kind of tasteless. They should definitely be dressed up. Nice pics! Yours are lovely. I hadn’t had them before either. I’m so jealous that all of yours closed! Mine had huge openings in the tops. I grew up with Yorkshire Pudding and foudn these to be much the same. Making them brought back some memories! Yours look really good. Yours do look cute and quite delicious! Sorry you didn’t enjoy them…they were a hit in my house! I thought very tasty…I enjoyed the custardy inside layer with melted butter and jam! Yours look beautiful.. I did not get them either when I tasted them plain, but they go really well with feta and honey if you try next time.. I like your mini version! Oh no! So sorry that you were not a fan – but your popovers look gorgeous. i’d never tried a popover before, but I was in love. Weeta-Bix over a popover?! I tried to like it when I was in NZ but it just didn’t happen. Different strokes for different folks 🙂 I think your minis are super cute though. Did you watch TB this week? How do you think the season will end? We love our Weet-Bix! 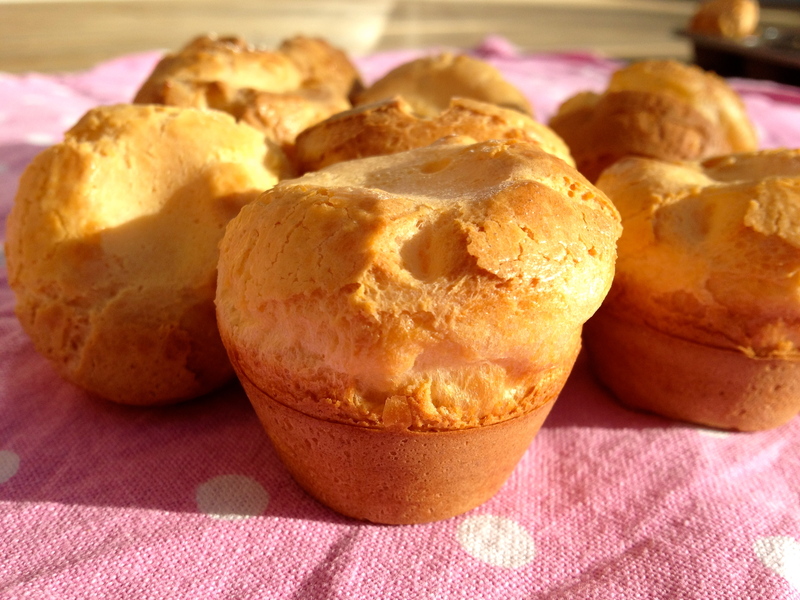 But not sure if they’ll go with a popover! I can’t believe it’s the last episode of True Blood. I don’t want it to be over for another season! I honestly am at a loss as to how it will finish. Do you have any ideas? I’ve loved this season. They are cute in the mini style. They are tasteless on their own, but delicious filled with butter and honey, or gravy. sorta like yorkshire pudding. Sorry you didn’t like them, but they were easy!! A bit more salt and a little sugar helps, but I think they’re meant to be dressed up a bit. Nice mini’s!